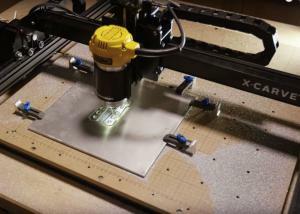 running via Easel software from inventables. Ensure work surface is properly secured. Training Content (Required Reading / Watching) prior to use. Need to monitor, Dimensional accuracy. please notify if items are not cutting properly. Nathan adjusted the x/y distances. $100=26.874 $101=26.694 in the Machine Inspector console.